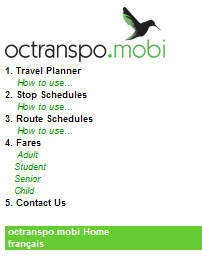 A new official mobile interface from OCTranspo: http://octranspo.mobi/. I’ve yet to see if it will be quicker/more easy to use than http://m.ocinfo.ca/ (formerly remino.net/oc560), but it certainly has more options and a mobile interface of the travel planner. Much happier times in OC Transpo travel planning!